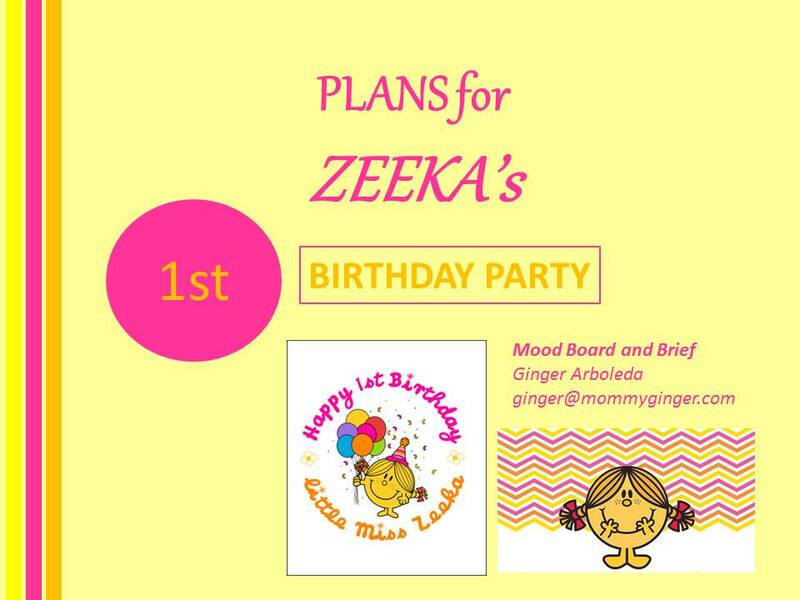 February Blog Theme is Planning… Mostly Zeeka’s First Birthday Plans! Are you curious to know if I already started planning for my daughter’s first birthday party? If you’re not, I will tell you anyway (haha!). Well, for those who know that I am very OC when it comes to planning, I’m sure you have already figured out that I have already started. It’s been a while since I have planned a party like this for myself. Well, you’d probably think “Oh, she’s an events planner so she probably holds a lot of workshops AND parties for herself and her family…” WRONG! It’s so sad, since most of the planning that I do is for other people…. huhuhu! I think the last time I got to plan for myself was for my wedding. But of course, for my little sweetheart’s first birthday, I could and would not let this occasion pass. I want to be hands-on on this one. So last October 2014 (I think! ), I started planning already for Zeeka’s birthday. Of course, it wasn’t ‘panic-mode’ planning, but more of relaxed canvassing of different suppliers. Call me crazy, but an important part to having a great party is really the planning stage. With planning, you set the direction for everything that will happen during the party. You need to show the suppliers that you know what you want. You need to see that you have enough budget for everything that’s necessary. For Zeeka’s party, my theme will be…. I think it’s the perfect them for Zeeka, since she has this bright and sunny disposition always. She makes her DADA and me smile all the time. 🙂 Plus, the character reminds me of Zeeka… hehe! This is actually the title slide of a presentation composed of 17 slides. I love Power Point and I use it for everything — even Zeeka’s first birthday party. This presentation is made out of little notes that I made for my possible and chosen suppliers. It has pictures of pegs and samples of how I would want things to look like. It sets the tone, mood and feel of the entire event. The notes in the slides are detailed. I will show the slides to you as I go through each supplier one by one this month, since February’s posts are dedicated to planning for Zeeka’s party (I’m sure i’ll be preoccupied with that so I thought about writing a about it). As for the budget, looking at the actual costs, it turns out that the total budget that I have when divided by the number guests (approximation) turns out to be around Php 1200 – Php 1500 per person (but that’s just me). If you want a breakdown of the costs on a per ‘type of expense’ basis, do leave a comment in this post and i’ll email it to you. The costs that I will email you is based on what I have for Zeeka. Your costs can actually increase or decrease based on certain priorities that you have (for example, if you really really want a videographer, then you can add that to the budget that I made or if styro backdrops are not necessary for you, then you can adjust that in the budget that I made). Again, throughout February, I will be featuring party suppliers which I have worked with for Zeeka’s first birthday party. If you are offering a unique product that I might be interested in getting since it works with Zeeka’s theme, do let me know. For those who want to share their own parties and if you want to be featured in my blog, feel free to check out the guidelines on this page: http://mommyginger.com/party-planning.